Air entrainment affects compressive strength of concrete and its workability. It increases the workability of concrete without much increase in water-cement ratio. Compressive strength of concrete is inversely proportional to workability of concrete. When workability of concrete increases, its compressive strength decreases. Therefore, concrete workability cannot be increased to improve concrete placement and compaction since it declines concrete strength. In this case, air entraining admixture is added to increase workability without adding water. However, introduction of air entrainment shall be thoroughly studied to found out its influence concrete properties; specifically, concrete strength. Air entraining admixture is usually introduced when it is desired to increase concrete workability without affecting much reduction in compressive strength. It is claimed that, the place-ability of an air entrained concrete having 7.5 cm slump is better than a non-air entrained concrete with a slump of 12.5 cm. 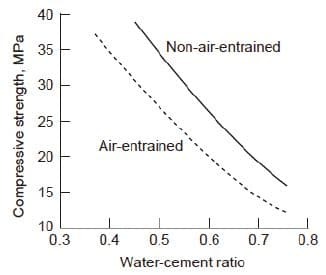 By and large, the compressive strength of concrete is reduced by use of air entrained admixture, as shown in Fig. 1. The amount of reduction in strength depends on many factors such as mix proportions, type and grading of concrete, cement and actual air-entraining agent. Normal reduction in strength of concrete by use of air-entrained admixtures varies from 3 to 7%. This variation of strength shall be considered in the mix design of concrete so that a desired compressive strength is achieved with required amount of admixture and workability. Suitably, trial mix designs should be done to find exact variation of strength with the use of this admixture and suitable corrections should be done in mix design to ensure desired strength. Typically, it may be assumed that a loss of 5% in compressive strength of concrete occurs due to each 1% by volume of entrained air in the concrete mix. A: percentage by volume of entrained air. Finally, it is demonstrated that, compressive strength of lean concrete mix increases provided that, maximum water reduction is considered and small maximum aggregate size is employed. Generally, the influence of air entrainment on flexural strength of concrete is not as detrimental as in the case of concrete compressive strength. It is reported that, maximum flexural strength can be achieved even with air contant of 4%. 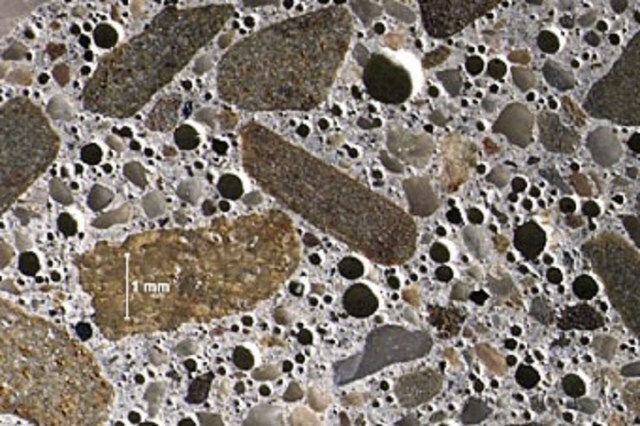 It is shown that, flexural strength of lean concrete mix increases provided that, maximum water reduction is considered and small maximum aggregate size is employed.